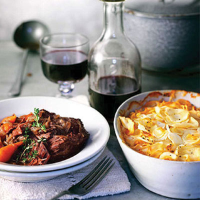 The gratin is cooked long and slow, so that it can go into the oven with the ox cheeks. Preheat the oven to 150C/gas 2. Season the flour, tip it onto a plate and use it to coat the ox cheeks. Heat the oil in a casserole; sear the cheeks for 5 minutes, until golden. Remove to a plate. Cook the onions and bacon in the casserole for 5 minutes, stirring, then add the other ingredients bar one thyme sprig and the carrots and cover. Partner this dish with a full and poised burgundy.